Sign up for free and just shop with musicMagpie as normal. Our average member earns over £300 cashback a year. Applicable when you sell Tech, including mobile phones, tablets, laptops & games consoles, for the first time. Applicable when you sell CDs, DVDs, Blu-Rays, Games and Books for the first time. Applicable when you complete an order on the musicMagpie Store. Applicable every time you complete a subsequent musicMagpie order. musicMagpie cashback can be earned simply by clicking through to the merchant and shopping as normal. musicMagpie Cashback is available through TopCashback on genuine, tracked transactions completed immediately and wholly online. Any unauthorised vouchercodes or offers that are promoted and/or used will result in commission not being paid. Cashback is only paid on the net value excluding VAT and delivery. 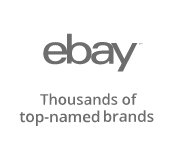 Buy from millions of new and used music CDs, Blu-rays, games and vinyl records which are offered in the musicMagpie store. You can also save money by purchasing refurbished mobile phones and the latest tech from popular brands like Sony and Microsoft, which all come with a 12-month quality guarantee to provide you with peace of mind. Whether you are buying music, a DVD collection of your favourite TV series or movie franchise or a phone, you will benefit from free delivery. Search their various entertainment and electronics categories and get a great discount, while you can save even more when you buy if you sign up to TopCashback using the form at the bottom of this page and take up one of our musicMagpie promo codes or cashback deals. If you are lacking in space and need to get rid of some unwanted items, it is easy to sell CDs, DVDs and games with musicMagpie. When it comes to getting an instant price for the products you are wanting to sell, just enter the barcode and send them off in a box for free. Yes, it is as easy as that. You can either take your package to a local ParcelShop and use the free Send Service, or they can arrange a courier to collect it for no extra cost. As well as CDs, DVDs and games, musicMagpie will also buy books, mobile phones - including an Apple iPhone or Samsung Galaxy - and other entertainment products, such as games consoles or your iPad or iPod. Receive the cash for the unwanted items you are selling even faster with same day payments from musicMagpie. Your money will be in your bank account the next working day thanks to the fact they will pay you on the same day they receive your items. So, not only will you be getting money for your unwanted goods, but if you need some quick cash, it represents a safe and easy alternative to a payday loan. If you need money to pay a bill or for a day out, you can get your hands on some quickly rather than having to wait between three and five days for a BACS transfer to be completed, as you would have to with some other sites. It is free to sell your CDs, DVDs, games and books, and you can be sure that no other site will pay you faster than musicMagpie as, once they have checked your items over, they will issue payment. If you are worried about whether or not you will receive the full amount quoted, their Tech Price Promise means that you can have your phone, tablet or games console back for free if you do not. Selling your items could not be easier. Get an instant price, package them in a box and send them off for free. It should be noted that same day payments apply to orders received before 2pm Monday-Friday. Any orders received after 2pm will be paid the next working day. You can sell your unwanted CDs, DVDs, games, books and top electronics equipment wherever you are by downloading the free musicMagpie app for your iOS or Android device from the App Store or Google Play. Use the app's barcode scanner on the items you are looking to get rid of to get an instant price any time you like through your device's camera, or by selecting your tech with a couple of taps of your screen. The app will allow you to book your courier or find your nearest ParcelShop, while it will also save all of your orders. As well as making money for yourself, you can also make a difference to others by donating the cash you will get from selling your unwanted items to charity. Once you have completed your order to sell the CDs, games or books you no longer need, musicMagpie will give you the option to donate the money they have agreed to pay you to charity. Whether you would like to support the RSPCA, Breast Cancer Care, Barnardo's or the Terrence Higgins Trust, the list of charities you are able to select from help children, servicemen and animals who are in need of care and support. It is easy to sell unwanted CDs, DVDs, games, books, mobile phones and more with musicMagpie. Select the item you want to sell and get an instant price, though you will need to sell at least £5 worth of items. Box it up and choose to send it or have it picked up by courier for free. 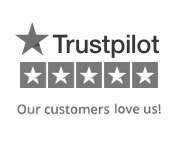 You will then get paid the same day they receive your item via a choice of payment methods. How Does Musicmagpie Make Money? musicMagpie make money by taking the items customers send them, refurbishing them and selling them on through channels such as Amazon Marketplace. They sell into 140 countries, including Japan, where they are a major seller of Western music. Do They Return Rejected Items? Items musicMagpie cannot accept will be rejected and recycled responsibly at their own cost. They are unable to hold onto or return rejected media items. To find out if your items have passed their quality assessment, you should log in to your online account as they will update the order details. It is different for tech items and you should check out the specific section in their FAQs. In order to sell CDs, DVDs, games and books, all you will need to do is enter the barcode (without spaces or dashes) in the box on the website. For tech items, just enter the make and the model, or you can choose it from their drop-down list. If you are looking for a price for unwanted LEGO, meanwhile, put it in a bag, weigh it and select the nearest weight from the drop-down menu. How Long Do They Take To Pay? 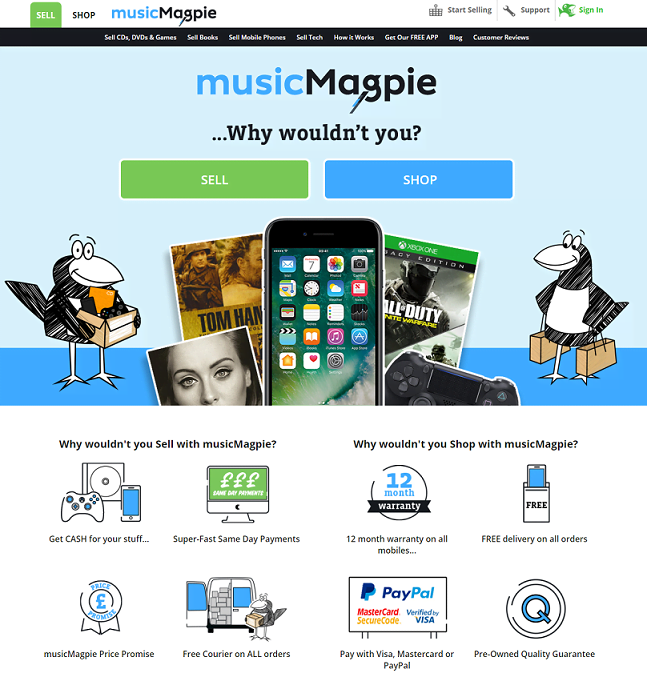 musicMagpie pay on the same day they receive your items - which is faster than any other site when it comes to CDs, DVDs, games and books. Choose to get paid by bank transfer or PayPal, meanwhile, and your money will be in your account, ready for you to spend, the next working day. Get cash for your unwanted items, or buy new and used tech and media items, all whilst earning great cashback rewards with these offers. musicMagpie have made decluttering and making some extra cash surprisingly easy. It is free and simple to do, just tell them what you are selling and they will give you an instant price. Put your items in a box and choose to get paid by bank transfer or cheque, or donate it to charity. Sell CDs, DVDs and games, as well as Blu-rays, books and electronics like mobile phones and games consoles online or via the mobile app. The musicMagpie Store also means that you can update your tech, dvds, vinyls, books and games with new or used items.